Gordon Hayward is strikingly tall. When removed from the context of other even taller people, it’s easy to look at him and think you never realized how tall he really is. That makes what Hayward used to be, and the player he’s trying to become again, ridiculously impressive. No humans the size of these NBA giants should move the way they do, but seeing the full scale of Hayward and remembering all the things he did on the court makes you appreciate how special he was. Hayward is currently struggling to turn that past tense present again. His shooting, the one thing he was really able to work on during his ankle injury rehab, is failing him right now. His raw percentages have dropped by 10 percent, dragging his efficiency into the toilet with it. His true shooting percentage currently sits behind Zaza Pachulia and Wayne Selden and just a hair above notorious non-shooter Rajon Rondo. Couple this with the slow-to-return raw athleticism that has cost him on drives to the basket and Hayward is off to an obviously frustrating start. So Hayward and the Celtics are leaning on his passing ability, the one thing that hasn’t abandoned him since his injury, to get him going. The Celtics’ struggles have hidden some of what Hayward has been able to bring during games. For example, he had four assists in Monday’s game in New Orleans, a statistic that alone seems pretty ordinary. Dig a little deeper, though, and you’ll see he also had 10 potential assists, which are passes that, had a shot gone in, would have been an assist for Hayward. Hayward has 120 potential assists in 19 games, an average of 6.3 per game. If you factor in the amount of overall passes he’s made and his assists, potential assists, and secondary assists (a pass that leads to an assist), nearly 30 percent of the passes he makes lead to something productive. Compare that to Kyrie Irving’s 35 percent and you can see that Hayward’s passing really has a positive impact on the Celtics. 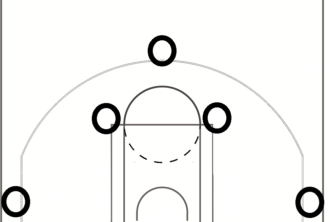 It’s a popular play around the basketball world. It’s versatile, and a great passer like Hayward can flourish in it. You’ll recognize the set when two players set up at each elbow, like this. Here he is in Utah running this play as the ball handler. Here’s another simple version with Hayward at one of those elbow areas. He gets the pass, Morris sets the pick for Terry Rozier, and Hayward hits him for a three. Here’s a version that really shows how much Hayward sees and how quickly he can set up a teammate. In the span of six seconds, he gets the ball twice, only uses one dribble, and still manages to find two players for possible shot attempts. Most people will forget about a play like this, which simply goes down as an obscure “potential assist,” but it’s a great example of how quickly he reads defenses and sets up his teammates. The problem for Hayward is passing often seems like the only way he gets involved. As his frustrations with his shooting and lack of explosiveness mount, an over-reliance on his passing is starting to emerge. Hayward knows that he’ll need to find balance eventually. The ultimate goal is for a defense to not know whether he’ll shoot or pass. Until then, the Celtics are hoping Hayward’s passing will be enough of a bridge as he tries to find his way back to the player he once was.